They say that nice guys finish last. It seems that Masai Ujiri has decided to embrace that adage this offseason. Just two months after firing the NBA Coach of the Year and fan favourite Dwane Casey, Ujiri and Co. were not satisfied with bringing back the same core of players that have fallen short in the playoffs the past two seasons. By "core", I'm talking about the all-star back court of Kyle Lowry and DeMar DeRozan. If this team wanted to reach an NBA Final for the first time in franchise history, one or both of these men would have to be moved. Unless you have insomnia, are parent to a newborn, or work incredibly weird hours, chances are that on July 18th, 2018 (dubbed "the most boring day in sports") you woke up to the news that the Raptors and Spurs agreed in principle on a trade sending Kawhi Leonard to Toronto and DeMar DeRozan to San Antonio. At first, I was unsure about the deal, only because the remaining details had not been released yet. How much extra was Toronto about to give up? Would I have seen OG or Siakam's last games in a Raptors uniform? How many picks would be given back? Would we have to eat that brutal Patty Mills contract? Once all my questions were answered, it was clear who won this trade. In case you are unaware of the full trade, here it is. When rumours first began to swirl regarding a potential "Kawhi Leonard to the Raptors" deal, pundits on social media were stating that it would take DeMar, OG, and MULTIPLE unprotected 1st round picks, PLUS picking up Patty Mills' contract. I thought it was ludacris to expect this type of haul for a "rental player" especially one that hasn't seen the floor in a year. The Spurs were about to be pigeon-holed, and I was public in stating that the Raptors would draw a line in the same, and find a way to keep OG for sure, and hopefully Siakam. When news broke that they were able to keep both, PLUS only give up one heavily protected 1st round pick in 2019, PLUS obtain another good player in Danny Green, PLUS get back $5 million dollars to help with tax relief...I couldn't have been happier. We all knew the cost of acquiring a top end talent would be either DeMar or Kyle going the other way in a deal. Until it becomes a reality, you don't realize how much it will sting to see one of them gone, and the death of the incredible "bromance" that they shared on the court. I can't recall any two Toronto athletes having the same chemistry and relationship that DeMar and Kyle shared together. It's something that I will miss for sure. The always entertaining post-game interviews, the segments that they would do together, the laughter that they shared. It's going to be interesting to see how Lowry reacts to this. Masai has stated in a press conference on Friday afternoon that he hadn't spoken with Lowry yet and that "I'm sure it will be really hard on him." Someone pointed out to me that Lowry had been through this before with the Rudy Gay trade. Rudy was (and still is) one of Lowry's best friends, and he is the godfather to Kyle's son. To have seen him traded away would have been gut-wrenching for Lowry, but he learned to develop a new relationship with DeMar. Hopefully he can take that same approach this time around, because the Raptors need him now more than ever. I have this notion that Raptors fans feel like they have to pick a side. They are either sad that DeMar is gone and criticize Masai Ujiri for trading away the most loyal player the Raptors have ever had, or they are exciting and feel no empathy for DeMar and his family. Why do we have to live in a world of absolutes? This trade and the circumstances surrounding it is one that the NBA hasn't seen in a very long time, so there's no "right way" to feel. Saying this, I'll provide you with my perspective on the situation, and hopefully it can provide you the reader with a different lens to view it through. DeMar was the heart and soul of this Raptors team the moment Chris Bosh walked out that door. His iconic "Don't worry, I got us..." tweet lives on in Raptors lore. He lived up to his tweet. He embraced the city. He was proud to rep not just the 6ix, but an entire nation. He helped make the Raptors relevant again. Kids were playing basketball in the streets, wearing their DeRozan Raptors jersey with pride. He never took a free agent meeting with any other team other than Toronto. He had a desire to retire a Raptor. It's emotional and difficult to see a player like that be traded for a player that may not want to return in a year. For all you have done for the Raptors, Toronto and the country of Canada, we thank you DeMar. On the other hand, it is rare that a top-5 player in the NBA is available in trade talks. When that happens, you need to do whatever it takes to try and secure a player of that calibre. To obtain a player such as Kawhi, the trade package will have to sting. Losing DeMar was the stinger, but it was necessary. This deal on paper is a massive win for the Raptors. They give up arguably their best player, but receive an even better player in the deal. Not to mention they got Danny Green as well, who is a reliable 3-and-D player who will be a welcome addition into the starting lineup. One aspect of this trade that is not really being talked about is the impact that this trade will have on OG Anunoby. OG's ceiling is Kawhi Leonard, as the two play a very similar type of play-style. OG can learn a lot from Kawhi, even if it's for just a year. This will work wonders for the growth and development of OG as a player, and provides him with a greater chance of reaching his ceiling than ever before. Over the course of his tenure as Raptors GM and Team President, Masai has made some moves to take this team from a bottom feeder to perennial contender. His first massive move was trading away Andrea Bargnani to the Knicks, which then turned into Jakob Poeltl, which then helped to turn into Kawhi Leonard. He traded away Rudy Gay, and the return package helped Toronto get to the playoffs for the first time since the 2007-08 season. They have made the playoffs for 4 straight years. They made it to an Eastern Conference Finals in 2016. Saying all of this, the last two years feel like the Raptors have fallen short, and Masai decided to finally change the nucleus of this team...one that was formed by former GM Bryan Colangelo. Masai fired a coach that he inherited. He made his first coaching hire ever as an NBA GM. He then traded away one of the "dynamic duo" in DeRozan. 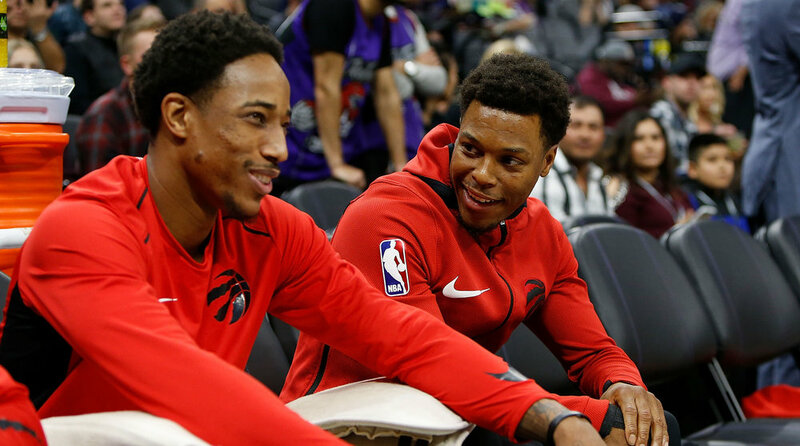 Lowry and DeRozan were a part of the Raptors prior to Masai's arrival. In essence, Masai's moves focused on adding around the core three of Lowry, DeRozan and Coach Casey. Now, with a rookie head coach in Nick Nurse, and the addition of Kawhi Leonard, Masai has now truly made his mark on this team. He has pushed all in with pocket Kings. Hopefully for Raptors fans everywhere, someone else doesn't have pocket Aces.